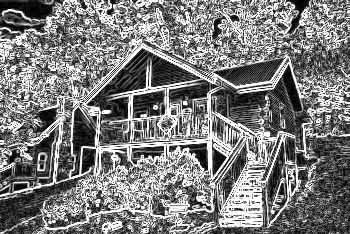 Cabins USA's Pigeon Forge cabin rentals with Hot Tubs, a great combination to fun and adventure in the beautiful Tennessee Smoky Mountains. Our Pigeon Forge cabins with hot tubs are located close to Pigeon Forge Attractions and provide for easy access to neighboring Gatlinburg, Wears Valley, Sevierville and The Great Smoky Mountains National Park. Cabins USA's hot tub cabins are the perfect end to a full day of hiking, shopping and sight seeing in the Tennessee Smokies. Grab your favorite beverage , then step into warm bubbling waters for some of the most enjoyable and soothing relaxation in the Smokies. Whether looking for a Tennessee Smoky Mountains weekend getaway, the perfect romantic honeymoon escape or that large family reunion cabin, Cabins USA offers some of the finest Smoky Mountains Pigeon Forge hot tub cabin rentals in the area. When making your hot tub rental cabin selection read over accompanying cabin amenities such as; game rooms with pool tables or foosball, arcade machines and more. Most our Pigeon Forge cabin rentals with hot tubs offer in-cabin Jacuzzis, a perfect fit to an intimate Smoky Mountains honeymoon getaway. SAVE with Cabins USA! Book your Smoky Mountains Pigeon Forge hot tub cabin ONLINE and receive an immediate savings on your rental cabin in the Smokies.